Mushroom enthusiasts look forward to this time of year. September brings us National Mushroom Month. You can thank the Mushroom Growers Council for helping to popularize this fungus. The month-long celebration was established in 1992 and there’s been no looking back. 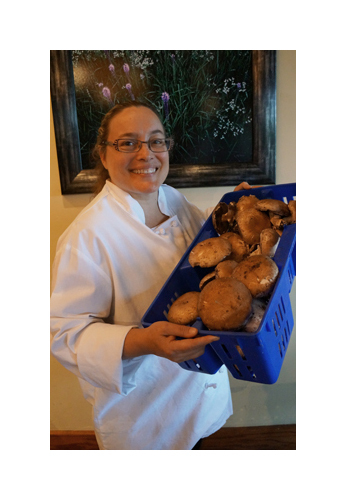 Sarah Stegner and George Bumbaris, chef/partners at Prairie Grass Cafe (601 Skokie Blvd., Northbrook, 847-205-4433) have a number of menu items showcasing various types of organic, local mushrooms. " We buy our Button, Portobello and Shitake mushrooms from farmer Eric Rose of River Valley Ranch in Burlington, Wisconsin, as they are a Certified Organic Farm and the oldest mushroom farm in the Midwest," Sarah says. "All crops are grown without pesticides or chemicals. We connected with them through the Green City Market." Prairie Grass Cafe has been a popular spot for mushroom dishes for years. They use more than 100 pounds of mushrooms a week. "Mushrooms provide rich earthy flavors that are intense and always so fresh. Out of all of the things that we use that are local, mushrooms impacted the flavors for which we are known the most; we use them in our stocks and sauces." she said. Prairie Grass Cafe is featuring an amazing mushroom soup ($5.50) as a weekly special this September. The Chefs also recommend the sautéed button mushrooms with red wine sauce to accompany steak dishes as a side ($6). Customer favorites include the Shitake mushrooms marinated with sesame soy sauce, that accompany the Ahi Tuna, seared rare with baby bok choy, shitake mushroom and spicy sesame soy sauce ($32), and Portobello mushrooms sautéed to accompany the Sautéed Lake Superior Whitefish ($21). Prairie Grass Cafe’s brunch menu features the popular Portobello Mushroom Benedict with two poached eggs over panko crusted Portobello mushrooms, sautéed spinach and lemon Hollandaise ($12.50) available Saturdays and Sundays only; 10 a.m. to 2 p.m. Saturday and 9:30 a.m. to 2 p.m. Sunday. Prairie Grass Cafe isn’t alone in their use of mushrooms. Last year, more than 900 million pounds of mushrooms were grown in the United States, with sales exceeding $1 billion. Stop by Prairie Grass Cafe this month and enjoy one of your favorites. Call 847-205-4433 to make a reservation. River Valley Ranch is the oldest mushroom farm in the Midwest. Bill Rose founded it in 1976 with a sizable goal: he wanted to produce the finest fresh mushrooms for the local market. Son, Eric, joined the operation in 1977, and learned the art of growing mushrooms commercially from his dad. River Valley Ranch still produces fine fresh mushrooms, and also grows other produce, including 20 varieties of heirloom tomatoes, 10 varieties of potatoes, a dozen types of peppers, 10 varieties of onions, asparagus, spinach, Winter squash and more. Eric's son Jordan Rose, joined the business one and a half years ago, after working for ten plus years in an array of restaurants in Chicago and Minnesota. He brings his culinary talents to the River Valley Ranch kitchen and is currently focusing on developing a broader line of value-added shelf-stable, frozen and fresh foods that they produce in their kitchen. Eric also is heading-up River Valley Ranch's new Chicago retail/cafe location at 1820 Wilson Ave., opening this Fall. All River Valley Ranch crops are grown without pesticides or chemicals. Since 1997, River Valley Kitchens, the farm’s licensed processing kitchen, has produced pickled mushrooms and more than 25 shelf-stable products. All preserved foods are made in small batches and hand packed. The farm’s motto is "Quality, freshness, and lots of Love"